"Be fearful when others are greedy and greedy only when others are fearful"
With huge gains in stocks, shares, bonds and property since the deep bear market that began in 2007, it is a good time to review investment portfolios, consider taking profits, and diversifying your investments. When things are going well, i.e. profitably, investors sometimes don’t pay as much attention as they should to the most common mistakes that they can make. The importance of the basics of long-term investing, asset allocation and investment diversification are forgotten when money is being made. In other words, when everybody has made a lot of money, it’s time to reconsider investments, take profits and perhaps become more cautious. But this is easier said than done! Most of us cut short our winning investments too soon, and hang on to our losing investments for too long - because of the way our minds are wired. It’s known as the disposition effect. Understanding how human minds work when it comes to investing is a part of behavioural finance, a field which studies the human impact on markets. Getting to grips with our minds is the first step towards helping us understand and potentially alleviate the psychological pain of a market downturn when it eventually comes. Because we know from experience - downturns always come! Let’s think about risk tolerance, or for non-professionals, the ability to absorb pain when it comes to investing. Many risk profiling methods categorise tolerance for investment risk as a figure, or banding, on a scale. Though limited in scope, it is useful if recognised as the upper limit of risk tolerance. Most people are not comfortable at the edge of their tolerance to pain, so why would an investor be comfortable with an investment portfolio which pushes their tolerance for risk? Everyone prefers to celebrate success not failure, another human response. But we forget what investment pain feels like, because not many of us have suffered pain in recent years with the markets booming. Therefore, it is highly likely that some investors are currently in a period of over-confidence with their investments, believing their investment decisions are superior to those of others. As a result, they may be more inclined to make risky investments, encouraged by the long period of the bull-markets. And so back to psychological pain. Simply taking on more and more investment risk does not guarantee more return, but it does pretty much guarantee more pain. However, if we hold a well managed investment long enough, and that can mean 20 years or more, we should expect a positive return. But the ride to get there could be very uncomfortable; most private investors will suffer from a combination of fear, desperation and outright panic at times, leading them to sell investments at the wrong time, thereby NEVER achieving the long-term profits that they could enjoy if they just held on. So what can investors do to reduce the psychological pain of losses when investing? This weighting of different assets in your portfolio will make a big difference to returns, and must be within the investor’s tolerance to risk, or they may be in for a very uncomfortable journey. We'll explore this further in a future blog post. Choose to track an index instead of guessing the market, blot out all the market noise and become a couch potato investor! 3) Choose to work with a passive adviser. I don't mean an adviser who does nothing! But a chartered financial planner who is a proponent of passive investing. 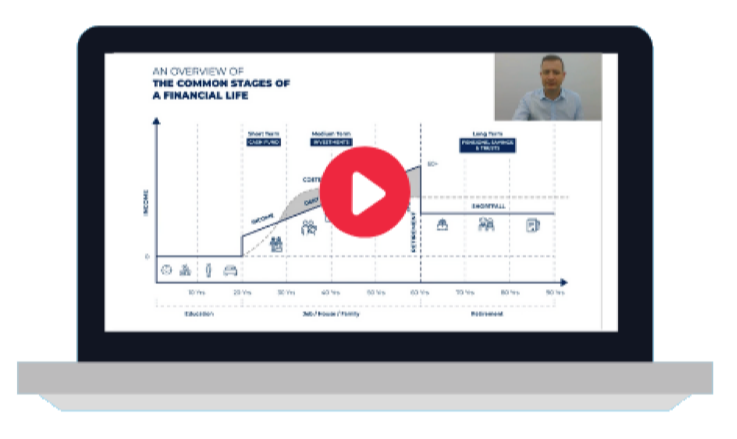 They will help you manage your emotions for investment success - and according to the investment experts at Vanguard, they add quantifiable financial value to investment returns. Just ask! We're here to help. Learn more about David Norton, Head of the Investment Services Team at AES International, and how his expertise helps clients grow their assets.